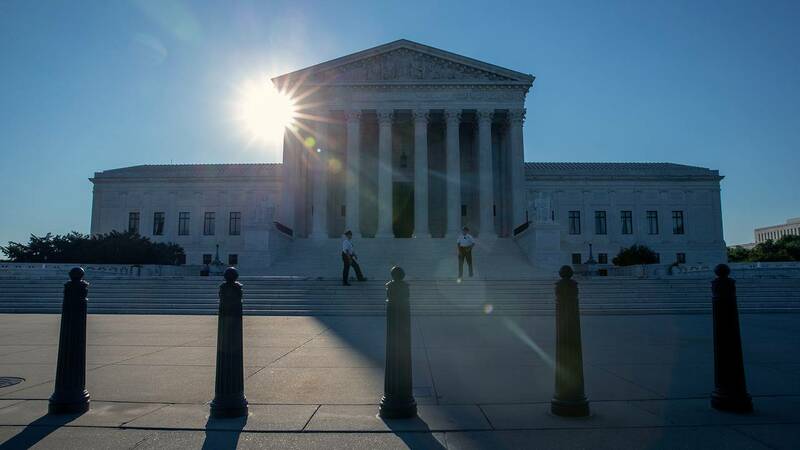 The sun rises over the United States Supreme Court on the morning of July 10, 2018. (CNN) - The Supreme Court is scheduled to return to a deeply divisive issue on Friday when the justices meet behind closed doors to discuss an issue left unresolved last term: when do states go too far in drawing district lines for partisan gain? The court has never established a standard to resolve extreme partisan gerrymanders, and if it chooses to do so, it could revolutionize the way congressional and state legislative maps are drawn. The issue often divides conservatives, who have suggested that courts should steer clear of such political disputes, and liberals, like Justice Elena Kagan, who contend that courts should be able to articulate a standard to combat a practice she believes "enables politicians to entrench themselves in power against the people's will." Last term, the justices heard a case out of Wisconsin called Gill v. Whitford and critics of partisan gerrymandering hoped that a divided court -- led by Justice Anthony Kennedy -- might issue a sweeping ruling. Instead, the court dodged key issues and sent the case back down to the lower courts to take another look at a threshold issue. Writing for a 9-0 court, Chief Justice John Roberts said that the Democratic plaintiffs challenging Republican-drawn maps had not done enough to establish "concrete and particularized injuries" necessary to bring the case. Although the opinion was unanimous, it sidestepped the merits of the case and masked deep divisions on the court. Kagan, writing for the liberals on the bench, agreed the case should be sent back, but in a concurring opinion offered a roadmap for future challenges. "Courts -- and in particular this court -- will again be called on to redress extreme partisan gerrymanders," Kagan wrote. "I am hopeful we will then step up to our responsibility to vindicate the Constitution against a contrary law," she said. One very important thing happened after Kagan wrote the opinion. Kennedy retired. Unlike his conservative colleagues, Kennedy believed a standard was possible, although he never found one he liked. After he retired, some critics of partisan gerrymanders lamented that they might have lost their best hope at a judicial solution to the problem. Rick Hasen, an election law expert at the University of California, Irvine, notes that Brett Kavanaugh, Kennedy's replacement, has not ruled on the issue as a judge. "But his overall judicial philosophy suggests he's likely to join with other conservatives and hold that courts have no business policing the political drawing of lines under the U.S. Constitution," Hasen said. Friday's case, Rucho v. Common Cause, is brought by voting rights groups and voters who filed a lawsuit arguing that North Carolina's 2016 congressional district maps drawn by Republican legislators amount to an unconstitutional partisan gerrymander that intentionally diluted the electoral strength of individuals who oppose Republicans. They also say the maps illegally punished supporters of non-Republican candidates on the basis of their political beliefs in violation of the First Amendment. In August, a three-judge district court panel issued a 321-page opinion and held that the North Carolina voters had the legal right to bring claims and that the plan violated the Constitution. The court said that the state General Assembly "deprived Democratic voters of their 'natural political strength' by making it difficult for such voters to raise money, attract strong candidates and motivate fellow party members and independent voters to campaign and vote." Paul Clement, a lawyer for North Carolina's Senate Redistricting Committee argues in briefs before the Supreme Court that the lower court was wrong when it identified a test to strike down the map as unconstitutional. Courts cannot create workable tests for "separating excessive partisan gerrymandering from the run-of-the-mill consideration of partisan advantage by legislatures organized along party lines," Clement argues. "As decades of fruitless efforts have proven, trying to identify 'judicially discernible and manageagble standards' for adjudicating generalized political grievances is an exercise in futility," he wrote. But the challengers told the justices a different story. They pointed to what occurred in North Carolina in the 2016 election and said that Republican candidates won 10 out of 13 seats, even though the statewide vote was nearly tied. North Carolina state Rep. David Lewis, the co-chair of the Joint Select Committee on Congressional Redistricting, convened a meeting in 2016 and said, "I propose that we draw the maps to give a partisan advantage to 10 Republicans and 3 Democrats." "When politicians feel brazen enough to not just admit but to openly declare that they are drawing political lines to rig the elections and punish certain voters, we need the Supreme Court to step in and say enough is enough," said Kathay Feng, a lawyer representing the challenges from Common Cause. The justices could announce its action on the case as soon as Friday afternoon.